Sasha Farina. Paper. Play. : Studio Calico/Hero Arts Blog Hop! Studio Calico/Hero Arts Blog Hop! I bet by now you're all enjoying all the eye candies put up by the awesome ladies from Studio Calico and Hero Arts. I must say, I'm so excited! I mean, c'mon.. Studio Calico and Hero Arts? What could be better??!! Here's what I did with the new stamps from Hero Arts. Pictured here are about 12 stamped kraft paper bags. I did 50, for Neha to giveaway on her birthday next month. I really, really love how the stamping transformed the simple and cheap kraft paper bags. I used the 'girl silhouette' from Silhouettes ST512 set and the 'woodgrain circle' and herringbone border stamp from My Happy ST508 set. I punched little hearts from the woodgrain circle and really loving the look. And the combination of kraft, turquoise and yellow really make the black silhouette stand out. What's inside, you ask? Well. . . I bought little wooden cubes from the dollar shop (not sure what's the original purpose of those) and altered them into magnets. I got the magnets from the dollar shop as well. What else is inside? For now, nothing yet. . I'm waiting for my order of tiny resin flowers. I'm gonna make 50 pairs of earrings, then get 50 chocolate bars and 50 blank notebooks I can customize. I'm sure we're gonna be adding more stuff to the bags.. let's hope they hold till August! We're giving away 5 Studio Calico + Hero Arts clear stamp sets for each day of the hop. (Monday through Wednesday). Just leave a comment on each stop on the hop and Hero Arts will pick a random winner from all of them :) The more comments you leave, the more chances you have win! I really hope you like my stamped kraft bags and magnets. They're simple to make. You can make some in an afternoon too! Now hop along to Emily Pitts! LOVE those gift bags... Sooooo cute! Personalized Gift Bags... Love how you used the stamp. Wow 50 lucky children are in for a treat the bags are fantastic great idea.. I love the paper bags they are really cute. Thank you for sharing and a chance to win. I love the bags, what a cute idea! Very cool and creative projects!!! LOVE them! One more great idea !! Love it !!! Love the bags--the wood-grain hearts are so cool! Love those bags! That turquoise really pops on the kraft. I think your bags are so cute! Very cool idea, those bags look so fancy now! I love that idea Sasha! May have to "steal" it for Maya's birthday next month! What a cute idea. Your daughter's friends will love you. Love the bags and love the wooden pieces, clever idea. How cute, love the little wood block magnets. Oh your so creative LOVE IT! I love that Silhouette image as well. Oh everything about it. and those little magnets are sweet as well. Clever idea of the goodie bag and magnet! Such a cute idea, looks like you will be busy! Cute little bags...perfect for a bday girl! I love the gift bags! Great idea! great projects so fun!!! !Love how you used these stamps!!!! Great projects, Sasha! Thanks for the chance to win! What fun gift bags! The stamps are fab! What a great idea! Fab work. This is cool!! I love your wooden boxes/magnets! oh........those bags are so cool.....and so are the magnets. These are super cute! Thanks for the inspiration. I might "borrow" this idea for treat bags for my daughter's school. I LOVE those bags! My daughter has a birthday at the end of the month and this is just a GREAT idea! Such cute little gift bags! nd I love that SC has teamed up with Hero Arts. What a winning combo! cute bags sasha! love how you used those stamps. I love your gift bags and the ideas for prizes inside! Cute gifts! I'm sure they'll love them. Really clever gift bag idea! So cute - great idea! Love your treat bags and the magnet idea. Super cool! LOve the paper bags and the silhouette stamps. cute projects! Love the paper bags. The stamps look amazing! What great ideas all of the designers have! Love your ideas. you are amazing!! love this idea!! I'm working on birthday happies too-thanks for the ideas! Love those magnets - so cute! Super cute Sasha! Love the gift bags and the cute magnets! Oh, my1 What an undertaking! These bags are adorable and your daughter's friends will LOVE them. Thanks for the inspiration! 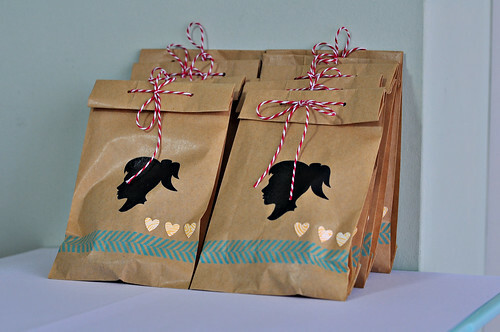 Love those bags and all your ideas for favors! So creative! Plus I love both SC and HA! Love these! Such a great idea! Wow! Fabulous projects, Sasha! Your bags are so cute and the magnets are a wonderful, little gift idea! Great project ideas. And I am loving the herringbone border! Oh hello! Can you say LOVE! So so love those gift bags Sasha & how you used those SC stamps! Can't wait to get these! Wow great idea. They are just so cute..
thanks for the inspiration, sasha! Great ideas for bags and boxes! Cute idea with the cube magnets! Love the magnets. Very cute. cute cute cute..and yes, the black really stands out! Love that silhouette stamp. Great idea on the paper bags, you're ambitious! I love those bags! But, 50? You are one brave lady! I'm inspired to use my stamps on things other than cards!! Awesome gift bags. Love how you used the stamps. Wow! What a lot of fun creating for the birthday girl to give away. The silhouette defintely transforms those kraft bags. Love the project. Adorable bags...and I love the little magnets inside! Too cute. What fun party decor ideas! So cute! I think that herringbone border stamp is my new favorite! Those little blocks look like topography maps! These gift bags are so cute and i love the wooden blocks. I have this stamp set and YOU have inspired me to pull them out!! Your bags and creative use of the stamps is SIMPLY so CLEVER!!!! Stamped bags - so clever like always! Beautiful projects - thanks for bringing the inspiration! Your goodie bags are so cute! So cute! I love the little hearts. Yikes! That's a lot of goodie bags but they look awesome!! Wow, how very clever and cute! Amazing what neat little things you can get at the dollar store and pretty them up with stamps and accessories! Well done! You are a genius. How you transformed those bags is just so beautiful. The gift bags are so cute. Love how you did the hearts. Thanks for sharing. Wow, that's a whole lotta gift bags...you are a nice momma. The bags are super cute. Those goodie bags are fabulous!!! Brilliant! And so stinkin' cute. . . Very cute bags!! Hopping through! That herringbone stamp is my fave! I've been so sad I haven't been able to purchase it. Yay!!!! A brown paper bag never looked so good! Really...it's adorable. The blocks are super cute. Love the wood grain as much as you! What a great idea for party favors, so creative. I need to bookmark the idea. thank you for the inspiration. Stamping is great too. You are one creative woman! Love those bags...so simple and striking! These will be a huge hit with her classmates! Adorable idea! Love this idea! That's a lot of goodie bags to get ready! NICE!!! Loving the gift bags! Just love that woodgrain! I am getting a reallly long list.....this is not good! Cute, Cute, CUte!!! Love the bags and those blocks are awesome too! WHat adorable, but not too girly, projects! I'm sure the girls will LOVE them Reminds me of my own DD when she was young. Wow! Your kraft bag goodies are so adorable. LOVE your projects!! Your design makes things so much easier to mass produce and that is so awesome! 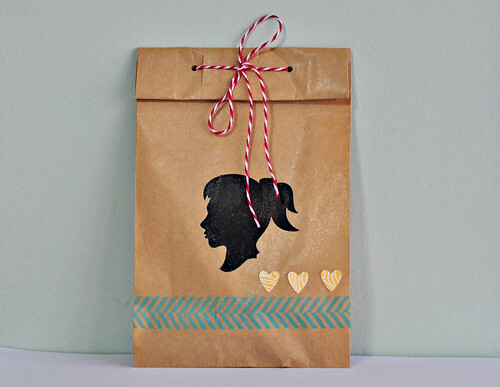 I love the simplistic look of your goodie bag - cool silhouette! Wowsers! There's 50 girls who are going to feel so special to be receiving those lovely goodie bags. What brilliant ideas! sasha - i love what you did with the kraft bags! so beautiful!!! Love the gift bags and the magnets! Your paper gift bags are so cute! Those bags are adorable! I love the woodgrain and the twine! The paper bags look amazing!!! Great treat bags! So creative. Love it. Wonderful gift bag idea! And I love that herringbone stamp! love the bags. Like the stamps you used. what great gift bags, i know they will be a hit! What fun projects! A great celebration of the Hero/Sudio Calico teaming up! Cuteness girl! So lovin these new stamps! Hope ur doing well! Hugs! Beautiful goodie bags, and I love the simple magnets. The woodgrain is awesome! Beautifully done! Those are the cutest gift bags Sasha! Thanks for a chance at some awesome giveaways! Digging that herringbone border stamp. It looks fab on kraft. Those bags are amazing!!! Sure hope you wil show us the earrings and notebooks that will go inside? Omgoodness....doesn't even matter what's inside the bags, because the outside is so cute!!! love 'em! I just love the gift bags. The magnets are cute and such a great idea. Love the goodie bags Sasha! Thanks for a chance at some great giveaways! Love those paper bags and magnets - great idea!! Great idea! The bags look wonderful. What gorgeous gift bags and magnets, they're going to love them! Gorgeous! I love the blue stamping on the kraft bag. So bright and pretty!!! Wow Sasha! Your paper bags are just simply gorgeous. The girls will be thrilled! Love the bags! That's a fabulous idea! What a clever idea to use the stamps! Love them! Great party favors! You are so creative with these stamps! You are one cool Mamma! Love your ideas. I'm a huge fan of the new wood grain stamps. What a great idea. This would be fabulous for goody bags. Thanks for sharing your awesomeness! these are so cute! i just love this idea!!! Great idea for personalizing plain paper bags! Oh I know your daughter and her friends will love the sweet treat bags you made!! Adorable! What a cute idea Sasha! And easy enough for mass-production. Genius! Very creative ideas! Thanks for great inspiration and the opportunity to win great prizes! How neat are those?!?! So cute! Fabulous gift bags and I love the little magnets! But 50? That's a big party! the bags are super! thanks! Solo cute! Thank you for the inspiration for girls party bags!! what adorable little gift bags! you really outdid yourself!! 50 of them? wow!!! I agree...what could be better!?! Although this blog jumping is great and the many ideas are amazing! love how you decorated those craft bags. such cute packaging? and those magnets... wonderful! Love the bags! What may I ask did you put in them?? These stamps are amazing!Can I possibly say that anymore? Sasha- those are darling! Loving the color combo on the bags, too. Thank you for the chance to win!! Adorable bags and magnets--such a great idea for birthday favors!! You are so darn clever! Love the bags. Supercute projects! I just love those giftbags you made! 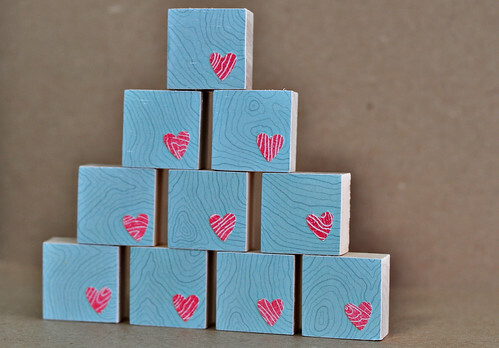 Love how you used the woodgrain stamp! Beautiful! Such inventive ideas! You got me thinking out of the bag... eh, box. Wow 50 bags! Love the paper bags and magnets, they are so cute! Can't wait to see the earrings you make! Love your cute ideas! Everyone will be happy to receive them! Nice gift bags. Some people will be very lucky to get them! An avalanche . . .